There is no doubt the fastest train in the world will be a boost to the economy. The construction of the SCMAGLEV alone is set to create 205,000 jobs nationwide. Factoring in additional growth in supporting industries and businesses, increased tax revenue to local municipalities, effects on tourism, and access to more of the region in less time, the economic benefits will be monumental! 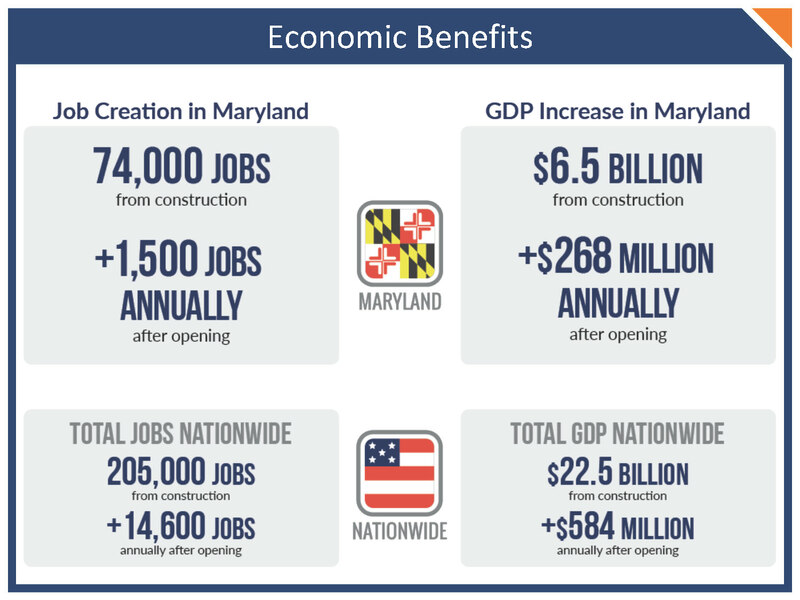 Want to bring thousands of jobs to the region? The SCMAGLEV will require thousands of skilled workers to build. Estimates show a nationwide need to fill 205,000 jobs over the construction period. The project will employ from many different industries like construction, steel, engineering, logistics, tunneling, geotechnical, geospatial, electrical, environmental, planning, and management. When construction is complete these workers will have gained the experience of working on one of the world’s most advanced transportation systems—something that will surely look great on a resume! In 2017 a Memorandum of Understanding was signed with the North American Building Trades Unions (NABTU) to utilize and develop skilled labor for future SCMAGLEV construction. We are working with the building trades unions to establish apprenticeship programs, and working with local educational institutions to develop programs to foster the job skills needed by all aspects of the project. In addition to hiring skilled labor, our vision is to provide a path for local youth to establish careers in highly skilled trades. The SCMAGLEV will bring the major cities of the Northeast Corridor much closer to each other. Business and industry will see an increase in available highly educated employees as more people will live within reach of major cities. More people will have access to top educational institutions and facilities along the Northeast Corridor. Businesses will also benefit from the larger number of potential consumers living within 90 minutes of downtown areas. A conservative estimate indicates an increase in nationwide Gross-Domestic-Product of $22.5 billion resulting from construction of the SCMAGLEV and an addition of over $500 million annually when revenue service starts. Internal estimates show taxes generated indirectly from the construction of the first phase of the SCMAGLEV to be around $600 million to state and local governments along the initial route – and this doesn’t include income taxes and other taxes generated from payments for construction labor on the project.